I grew up interested in fashion. I remember having a fashion sketchbook that had pages informing me about the different types of fabric and clothing. Back then, I learned the different names of women’s shoes from Mary Janes to espadrilles. I thought I already knew quite a lot about shoes; but when I attended the Shoepreneurship 101 workshop, it turned out I didn’t even know the half of it! Assuming most of us already know the anatomy of the foot, you need to learn how to measure the foot to get the perfect fit. You measure the foot by inches at the calf, heel, instep, waist, and balls of the feet. 3 hulmas shown in the pictures. The green hulma is made of plastic while the two beside it are made of wood. 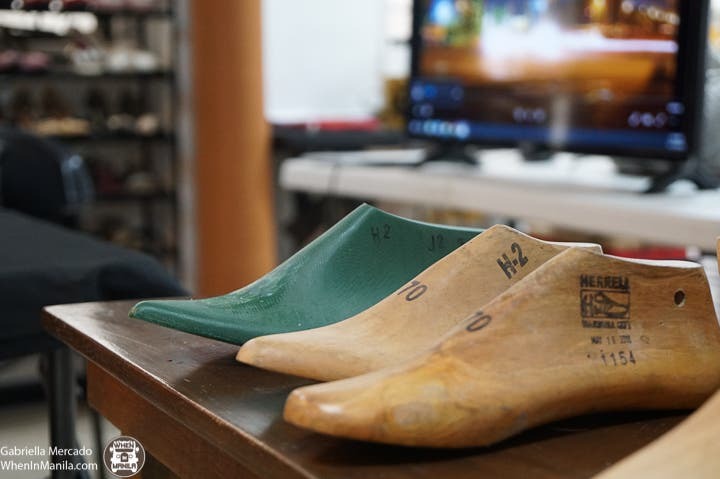 In making shoes, shoe makers use a shoe last or, in filipino, hulma. It forms the shoes and has variations depending on the material, toe shapes, size, and heel height. There are 10 basic shoe styles for men: monk straps, penny loafers, moccasins, boat shoes, oxfords, derbies, brogues, wing tips, chukka boots, and Chelsea boots. Zapateria’s clock showing the types of women’s shoes. For women, there are 15 basic shoe styles: doll shoes, Mary Janes, loafers, Penny loafers, oxfords, derbies, brogues, monk straps, mules, peep toes, d’Orsays, semi- d’orsays, sneakers, boots, and espadrilles. There are two types of leather we know: genuine and synthetic. Genuine leather has been used as a material for shoes for as long we can remember shoes were being made. This type of leather can last another lifetime if taken care of properly. These types of leather are usually made of cow hide, ostrich, and snake. The second type is synthetic leather, otherwise known as “vegan” leather. This type of leather is chemically made and usually isn’t durable. This type of leather mimics the different textures of genuine leather through stamping, and is far cheaper than its genuine counterpart. Here are 4 reasons why the floral polo should be your staple holiday outfit. Did you learn a thing or two about shoes in this article? If you want to learn more and start your own shoe business, sign up for Tal de Guzman’s Shoepreneurship 101 workshop. Bare Skin Waxing Studio’s Warm Wax: I’m A Convert!